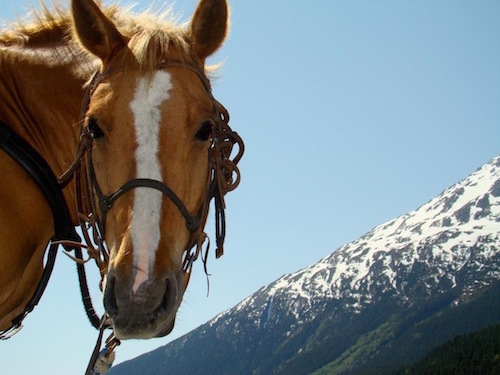 Your journey begins with a tour by van through the historic town of Skagway out to our ranch in Dyea. Along the way you'll see some of Alaska's most beautiful back-country wilderness and part of the Klondike Gold Rush National Park. Your adventure on horseback will begin deep in the heart of Dyea Valley and bring you to its original town site near the waterfront. Along the way your guides will enthrall you with stories of the area's gold rush history "Sourdough" style. You'll appreciate our gentle horses as you pose for a picture or watch the abundant wildlife. Riders of all experience levels are welcome to participate as no running of the horses is allowed on the trip: just an easy walk to give everyone plenty of time to enjoy the scenery. When you've finished your trek on horseback, sit down with your guides as you enjoy a beverage and some of our famous alderwood smoked salmon pate!